There are several nice restaurants along the coast in Talpe with lovely pools offering different kinds of food. If you are here during peak season, it’s probably a good idea to book depending on what you think you might want to do. Why Beach Villa (WB) (contact: +94 91 228 2922) is an Italian restaurant right on the beach, Fleurts (contact: +94 77 664 2271) is a nice place with a beautiful pool and french bistro food! Wijaya Beach (contact: +94 77 790 3431) is where all the in-crowd is. This is a great place with great food and service, reasonably priced. They even make real pizza in a wood burning oven. There’s a lagoon on the left hand side which provides safe swimming for you and your kids. On the right hand is a great surf break which is fun to watch from the restaurant with a sun-downer in your hand. We must say that we spend a great deal of time there. The Beach in Mirissa offers the typical Asian beach thing, lots of small restaurants. Pick the fish you want from the daily catch and it will be cooked for you. There’s no need to book for this. Galle Fort Hotel (contact: +94 91 223 2870) apparently has superb Asian fusion cuisine and excellent service. The Amangalla Restaurant (contact: +94 91 223 3388) has some truly irresistible food to enjoy. You definitely need to book these places and they are expensive. The Jetwing Lighthouse (contact: +94 91 222 3744) is a hotel designed by Geoffry Bawa in Galle. It does fantastic buffets. The Pedlars Inn Cafe (contact: +94 77 314 1477) in the Fort is a great place to watch life go by. This relaxed inn serves great coffee, western food and amazing chocolate brownies as well. A garden area at the rear offers additional seating. The Fort Printers (contact: +94 91 224 7977) in the Fort offers wonderful food in a beautiful setting. The candlelit dining area next to the pool is very romantic and quiet. They’ve got a great wine list too. For a complete list of restaurants in the Galle Fort visit the Galle Fort website. We would suggest that you have a look at Trip Advisor for restaurants in Galle and you will find reviews for most of what we have mentioned and many more besides. There is a very nice seafood place on the beach in Ahangama called Wadiya. The owner supplies the seafood to most of the big hotels on the south west coast. The food is good, but you will probably be the only guests – so not too much atmosphere. Another great place for Sri Lankan food is Sayurima Hotel, a few kilometers out of Ahangama towards Welligama. It is right by the sea and serves good local food for little money. 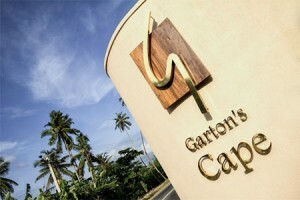 A few hundred metres from Sayurima towards Weligama the brand new and flashy hotel Garton’s Cape has opened in 2013. It has very nice food and a beautiful swimming pool right on the beach which they charge to use. It also has a rooftop restaurant with views out across the ocean. If you are having difficulties finding places, just tell Kapila the name of the place you want to go and he will make sure you get there in time.